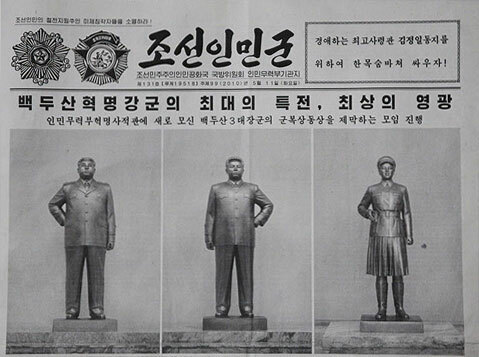 A statue of Kim Jong Il has been revealed in a North Korean newspaper obtained by Open Radio for North Korea. “There has been an unveiling ceremony of statues of the ‘Three Mt. Baekdu Generals’ (Kim Il Sung, Kim Jong Il and Kim Jong Suk) dressed in military uniform at the Revolutionary History Museum of the Ministry of the People’s Armed Forces,” the front page article explained. The report added that Chief of Staff of the Chosun People’s Army Lee Young Ho and First Vice-Director of the General Political Department of the People’s Army Kim Jung Kak took part in the ceremony. “I think that is natural, because it is the only university which is named after Kim Jong Il. There is no Kim Jong Il statue in any other province or in official buildings, though” he added. Additionally, a 2008 report asserted that a gold statue of Kim Jong Il can be found “in the area in front of the National Security Agency office building at the foot of Mt. Amee in Daesung district, Pyongyang.” This one, the report asserted, was erected on Kim Jong Il’s 46th birthday in 1988, but no photos exist to corroborate the claim. Another, white plaster statue of Kim can be found at the International Friendship Exhibition at Mt. Myohang, north of Pyongyang, this one a stalwart on the North Korean tourist trail. 1. An image of the Kim Jong-il statue at Myohyangsan can be seen here (link). Scroll down until you see it. 2. 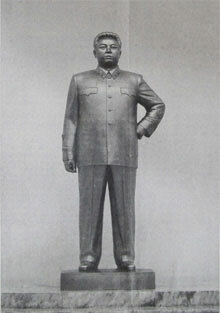 The Kim Jong il statue reminds me of the Laurent Kabila statue in Kinshasa (both made by the Mansudae Art Studio). Last August I posted an excerpt from Andrei Lankov’s book, North of the DMZ, on the preservation of Kim il Sung’s body in Kamsusan Memorial Palace. This year, the Daily NK (here and here) provides some new information on Kim il Sung’s imposing presence on the North Korean landscape. 1. There are approximately 70 Kim il Sung statues in North Korea (large statues a la Mansu Hill in Pyongyang). 2. There are approximately 30,000 plaster busts. 4. There is allegedly one Kim Jong il statue in Pyongyang (although the Daily NK is the only source I have ever heard make this claim). 5. The first Kim il Sung statue was at the Mangyongdae Revolutionary School on 10/24/1948. The second was in front of the Changjeon School in 1949. The most recent is at Kim il Sung University in 1996. Apparently all of the statues are made of bronze, but are coated in a gold paint every two years to prevent them from corroding. The gold paint is allegedly imported from Germany (Can any German readers/speakers find out which German company supplies the paint? How much? And at what cost? ). All of the likenesses of the Great Leader are exclusively constructed by the Mansudae Art Studio’s “Number One Works Department” in Pyongyang. The workers in this group are tested annually by a deliberation committee so they can be certified to work on Kim statues, etc. These individuals are the only ones legally allowed to reproduce the leader’s image in North Korea. Once a Kim statue is completed, it is transported by numerous agencies (security, party, and artists) to its destination where it is erected. Lamps are supposed to shine on the statues from 10:00pm until 4:00am. Local citizens are charged with keeping the area around the statue tidy (which can be verified on Google Earth). In the event of an emergency (such as a war), many statues allegedly have dedicated bunkers in which they can be stored. You are currently browsing the archives for the Mansu Art Studio category.